Insurance companies often put restrictions on the maximum quantity a patient can have. Fortunately, we do NOT process through any insurance company. According to the National Association of Boards of Pharmacy, and the law, a patient can attain up to a year supply on any Non-Control medication. However, HealthWarehouse can only fill for the Quantity Written by the Physician. Just ask your physician to write for the larger quantity, and we can fill it! You can mail in a new prescription, or have your physician Fax or Call us. 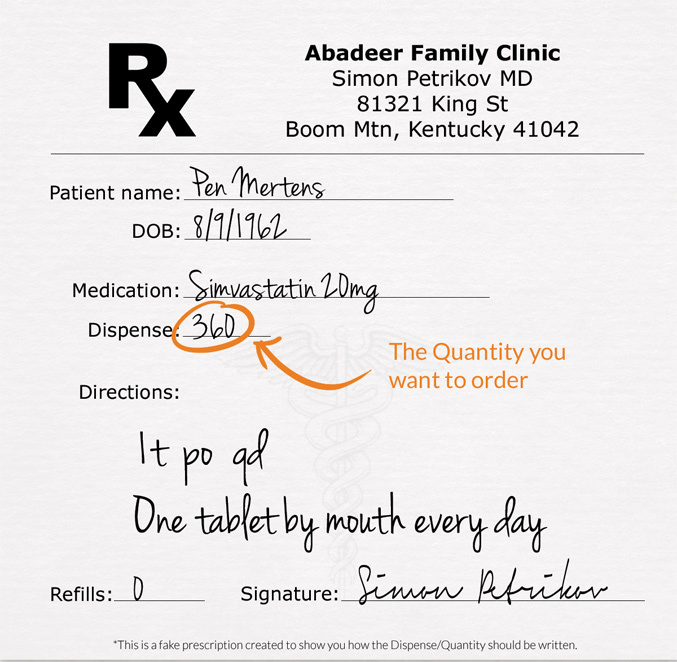 They can even send a prescription to us using ePrescription software. Just have them search for HealthWarehouse.com and the zip code 41042. Order up to a Year Supply. That's 365 days worry free with up to 60% savings. *These amounts are based on a 1 tablet a day regiment.